Shinedown Announces Summer Dates On ATTENTION ATTENTION World Tour – Fanfare Cafe – Entertainment Magazine and Event GuideUpcoming concerts, Broadway shows, movies…and more! 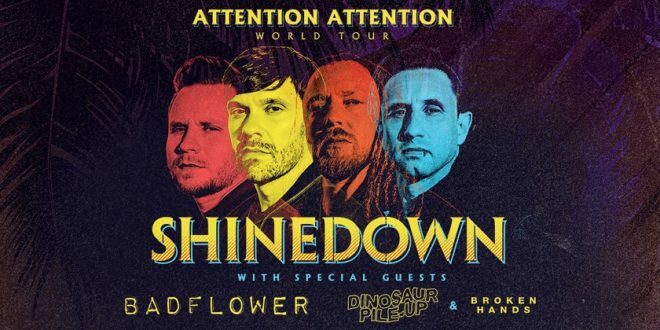 Multi-platinum rock band Shinedown has announced new summer tour dates on their 2019 ATTENTION ATTENTION World Tour, beginning June 21 through July 27. Badflower, Dinosaur Pile-Up, and Broken Hands will support Shinedown on these coast-to-coast dates produced by Live Nation. Shinedown’s new video for their anthemic single “GET UP,” (below)a collection of behind-the-scenes moments on tour and live footage from the road that gives an inside look into the powerful moments that “GET UP” is fostering between Shinedown and their fans. The uplifting #1 Active Rock and Top 25 Alternative hithas amassedmore than 27 million total streams, galvanizing listeners around the globe with its offer of hope, empathy and encouragement in the face of personal struggles, whatever they may be. Shinedown’s chart-topping album ATTENTION ATTENTION, out now viaAtlantic Records, simultaneously hit #1 on Billboard’s Alternative, Top Rock and Hard Rock Albums Charts and debuted Top 5 on the Billboard 200. The story that unfolds as the album progresses is a poignant and enduring statement about humanity, touching on topics such as overcoming struggles, mental health, not being afraid to fail and the resolve of the human spirit as seen on tracks like “DEVIL,” and the anthemic “THE HUMAN RADIO”. Given the deeply personal nature of the record, Shinedown went in-house for production for the first time ever, enlisting bassist Eric Bass to produce and mix the album in its entirety. Shinedown – Brent Smith [vocals], Zach Myers [guitar], Eric Bass [bass, production], and Barry Kerch [drums] – has sold more than 10 million albums and 10 million singles worldwide, has 11 platinum and gold singles and four platinum and gold albums, and 14 #1 active rock hits, and more than 1.5 billion total overall streams to date. Each of Shinedown’s 24 charting singles on Billboard’s Mainstream Rock Songs Chart has reached the top five – an unparalleled feat.